Aww, what a cute little birdie. Inside the belly of this cutie patootie—yeah, I said it—is a USB powered camera. This little gadget would add a little flair to any desktop and it is even available in three different colors to match whatever color scheme you have going on around your desk. 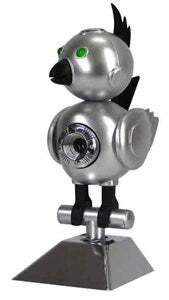 The official model name for the is the BC801M PC camera, but that name isn't as cute as Birdie Webcam. Regardless of how cute this bird webcam is, it will won't make the things you do in front of that webcam any more innocent, sicko.